Barbara Ann Mikulski (born July 20, 1936) is the senior United States Senator from Maryland and a member of the Democratic Party, serving since 1987. Mikulski, who served in the United States House of Representatives from 1977 to 1987, is the longest-serving woman in the history of the United States Congress. Raised in the Highlandtown neighborhood of East Baltimore, Mikulski attended Mount Saint Agnes College and the University of Maryland School of Social Work. Originally a social worker and community organizer, she was elected to the Baltimore City Council in 1971 after delivering a highly publicized address on the "ethnic movement" in America. She was elected to the federal House of Representatives in 1976, and in 1986 she became the first woman elected to the United States Senate from Maryland. From the death of Senator Daniel Inouye in December 2012 until 2015, Mikulski chaired the Senate Appropriations Committee, the first woman and first Marylander to hold the position. She is now the ranking minority member. She also serves on the Health, Education, Labor, and Pensions Committee and the Select Committee on Intelligence. After five terms in the Senate, on March 2, 2015, Mikulski announced that she would retire at the end of the 114th Congress in 2017. Mikulski was born and raised in the Highlandtown neighborhood of East Baltimore, the eldest of the three daughters of Christine Eleanor (née Kutz) and William Mikulski. Her parents were both of Polish descent; her immigrant great-grandparents had owned a bakery in Baltimore. During her high school years at the Institute of Notre Dame, she worked in her parents' grocery store, delivering groceries to elderly neighbors who were unable to leave their homes. After graduating with a Bachelor of Arts in Sociology from Mount Saint Agnes College (now a part of Loyola University Maryland) in 1958, she obtained her master's degree in social work (MSW) from the University of Maryland School of Social Work in 1965. She worked as a social worker for Catholic charities and Baltimore's Department of Social Services, helping at-risk children and educating seniors about the Medicare program. Mikulski became an activist social worker when she heard about plans to build Interstate 70 through Baltimore's Fells Point and Canton neighborhoods. She helped organize communities on both sides of the city and successfully fought to stop the construction of the road. Mikulski first received national attention in 1970, because of her remarks at a conference at The Catholic University of America regarding “Ethnic Americans”, convened by Msgr. Geno Baroni. Her message became one of the major documents of the “ethnic movement”. “ America is not a melting pot. It is a sizzling cauldron for the ethnic American who feels that he has been politically courted and legally extorted by both government and private enterprise. The ethnic American is sick of being stereotyped as a racist and dullard by phony white liberals, pseudo black militants and patronizing bureaucrats. He pays the bill for every major government program and gets nothing or little in the way of return. Tricked by the political rhetoric of the illusionary funding for black-oriented social programs, he turns his anger to race — when he himself is the victim of class prejudice. [He] has worked hard all his life to become a 'good American;' he and his sons have fought on every battlefield — then he is made fun of because he likes the flag. The ethnic American is overtaxed and underserved at every level of government. He does not have fancy lawyers or expensive lobbyists getting him tax breaks on his income. Being a home owner, he shoulders the rising property taxes — the major revenue source for the municipalities in which he lives. Yet he enjoys very little from these unfair and burdensome levies. ... [T]he ethnic American also feels unappreciated for the contribution he makes to society. He resents the way the working class is looked down upon. In many instances he is treated like the machine he operates or the pencil he pushes. He is tired of being treated like an object of production. The public and private institutions have made him frustrated by their lack of response to his needs. At present he feels powerless in his daily dealings with and efforts to change them. Unfortunately, because of old prejudices and new fears, anger is generated against other minority groups rather than those who have power. What is needed is an alliance of white and black, white collar, blue collar and no collar based on mutual need, interdependence and respect, an alliance to develop the strategy for new kinds of community organization and political participation. 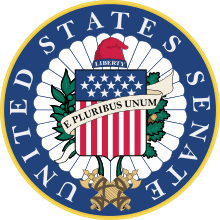 Mikulski challenged Charles Mathias for his Senate seat in 1974. Mikulski's activism led to a seat on the Baltimore City Council in 1971. In 1973 incoming Chairman of the Democratic National Committee Robert S. Strauss appointed then Baltimore City Councilman Mikulski to chair the Democratic Party Commission on New Delegate Selection and Party Structure. She was instrumental in solidifying democratizing reforms to the national delegate selection process. She then ran for the U.S. Senate in 1974, winning the Democratic nomination to face Republican incumbent Charles Mathias. Although well-known to residents in her city, Mikulski had limited name recognition in the rest of the state. With Maryland voters, Mathias benefited from his frequent disagreements with the Nixon administration and his liberal voting record. On November 5, 1974, he was re-elected by a 57% to 43% margin, though he lost badly in Baltimore City and Baltimore County, where Mikulski was popular. It has thus far been the only election that Mikulski ever lost. In 1976, Paul Sarbanes gave up his seat in Maryland's 3rd congressional district to make a successful run for the Senate. Mikulski won a crowded seven-way Democratic primary—the key election given a heavily Democratic district—and won easily in the November elections. She was reelected four more times, never facing substantive opposition. Mikulski speaking to a patient at a military hospital, 1980. Mathias announced his retirement before the 1986 elections. At the time of this announcement, it was expected that then-Governor Harry Hughes would be the favorite to succeed Mathias. However, Hughes became caught up in the aftermath of the Maryland savings and loan crisis. He lost popularity with voters, opening the door for Mikulski's bid for the Senate. The Republican nominee was Linda Chavez, who left her post as Assistant to the President for Public Liaison in an attempt to win the seat. The election was the second time in modern U.S. history that two women faced each other in a statewide general election. The race was covered by national media, with observers noting that Chavez was very unlikely to win. In the campaign, Chavez attacked Mikulski, a lifelong Baltimore resident, as a "San Francisco-style, George McGovern, liberal Democrat". Chavez was accused of making Mikulski's sexual orientation a central issue of the political campaign. Chavez wrote that the term referred to Jeane Kirkpatrick's 1984 Republican National Convention "Blame America First" speech, in which she coined the phrase "San Francisco Liberal" in reference to the Democratic National Convention in San Francisco. Using political advertisements and press conferences, Chavez attacked Mikulski's former aide Teresa Brennan as "anti-male" and a "radical feminist", implying that Brennan and Mikulski were radical lesbians and that "fascist feminism" was Mikulski's political philosophy. Brennan had not been part of Mikulski's staff for five years, but Chavez implied Brennan was still working on Mikulski's campaign. Mikulski did not respond in kind to the attacks. She defeated Chavez with 61% of the vote. She was the first woman who was elected to the Senate who did not have a husband or father who served in high political office. She also served alongside Paul Sarbanes, the man she'd succeeded in the House. 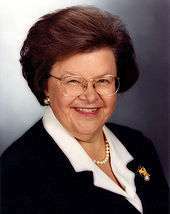 Mikulski, popularly known as "Senator Barb", was re-elected with large majorities in 1992, 1998, 2004, and 2010. Having won re-election in 2010, she has surpassed Margaret Chase Smith as the longest-serving female senator. ABC News named Mikulski its Person of the Week for that milestone. On March 17, 2012, she became the longest-serving female member of Congress in the history of the United States, surpassing the previous record-holder, Rep. Edith Nourse Rogers of Massachusetts, who served from 1925 to 1960. Senator Mikulski joins Senator Kit Bond and actor David Hyde Pierce in promoting awareness of Alzheimer's disease. 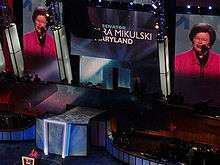 Mikulski speaks at the 2008 Democratic National Convention. In September 2009, the "tell-all" book The Clinton Tapes revealed that during the 2000 presidential election, President Bill Clinton suggested Mikulski as a running mate for Al Gore, who instead chose her colleague Joe Lieberman. In 2007, Mikulski endorsed her colleague, Sen. Hillary Clinton (D-NY), for President of the United States, praising her as a leader and citing her desire to break the "glass ceiling" by electing the first woman president. Senator Mikulski nominated Hillary Clinton for President of the United States at the Democratic National Convention on July 26, 2016. Since 2007, Mikulski has served alongside Ben Cardin, who succeeded her in the 3rd District and held it for 20 years until succeeding Sarbanes in the Senate. On June 3, 2013, Mikulski introduced the Child Care and Development Block Grant Act of 2013 (S. 1086; 113th Congress), which passed in the Senate. The bill would reauthorize the Child Care and Development Block Grant Act of 1990 to provide block grants to the states to help low-income parents find child care for their children. In addition to reauthorizing the program, it also makes amendments to the law to try to improve it. Some of those improvements include required background checks on grant recipients and annual inspections. Mikulski argued that "this bill ensures that all children get the care they need and deserve." On April 1, 2014, Mikulski introduced the Paycheck Fairness Act (S. 2199; 113th Congress), a measure that aims to strengthen the Fair Labor Standards Act's protections against pay inequalities based on gender. It is a bill that "punishes employers for retaliating against workers who share wage information, puts the justification burden on employers as to why someone is paid less and allows workers to sue for punitive damages of wage discrimination". Mikulski said that "it brings tears to my eyes to know women are working so hard and being paid less" and that "it makes me emotional when I hear that... I get angry, I get outraged and I get volcanic". Mikulski was one of 11 senators to vote against both the 1991 and 2002 resolutions authorizing the use of force in Iraq. Mikulski has opposed predatory lending, and has had been an outspoken opponent of Fairbanks Capital (now Select Portfolio Servicing), alleged to have illegally foreclosed on over 100 homes in Maryland. Mikulski has been an outspoken advocate for abortion rights, but has stated she does not view the opposition to this issue as misogynistic. On October 1, 2008, Mikulski voted in favor of HR1424, the Senate version of the Emergency Economic Stabilization Act of 2008, which provided a $700 billion bailout to the United States financial market. In October 2013, Mikulski sponsored a bill honoring naturopathic medicine. Mikulski has been voted the "meanest senator" in Washingtonian's survey of congressional staffers. *Third party notes: Henry Laque (Other) won 15,330 votes. **Third party notes: Write-in candidates won a combined 437 votes. ***Third party notes: Maria Allwine (Green) won 24,816 votes and Thomas Trump (Constitution) won 9,009 votes. ****Third party notes: Kenniss Henry (Green) won 20,717 votes and Richard Shawver (Constitution) 14,746 votes. Write-in candidates won a combined 2,792 votes. In 1979, the Supersisters trading card set was produced and distributed; one of the cards featured Mikulski's name and picture. 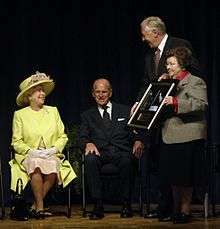 The NASA-funded Space Telescope Science Institute (STScI) in Baltimore named one of the world’s largest astronomy databases after Mikulski (Barbara A. Mikulski Archive for Space Telescopes), as she was a long time champion of the Hubble and James Webb space telescopes. In 2012, when NASA discovered an exploding star, they named it "Supernova Mikulski" in her honor. On August 22, 2013 the President of Poland Bronisław Komorowski honored Mikulski with a Commander's Cross with Star of the Order of Polonia Restituta for "outstanding achievements in the development of Polish-American cooperation and activity for Poles living in the United States". In November 2015, Mikulski was awarded the Presidential Medal of Freedom by President Barack Obama at a ceremony in the White House. ↑ O'Keefe, Ed (March 21, 2012). "Barbara Mikulski honored as longest-serving woman in Congress". The Washington Post. Retrieved November 6, 2013. ↑ "Sen. Barbara Mikulski of Md. will not seek a 6th term". WUSA9. Retrieved 2016-02-02. 1 2 "MIKULSKI, Barbara Ann - Biographical Information". bioguide.congress.gov. Retrieved 2016-02-02. ↑ "Barbara Mikulski, Maryland Women's Hall of Fame". msa.maryland.gov. Retrieved 2016-02-02. ↑ "Mikulski to Take Appropriations Post as Leahy Stays at Judiciary". Wall Street Journal. Retrieved 19 December 2012. ↑ "Barbara Mikulski, first female chair of Senate Appropriations, returns to minority". The Washington Post. November 16, 2014. Retrieved November 21, 2014. ↑ Grier, Peter (March 2, 2015). "Sen. Barbara Mikulski retiring: Will Martin O'Malley run?". The Christian Science Monitor. ↑ Gaudiano, Nicole (March 2, 2015). "Longtime Sen. Barbara Mikulski to retire". USA Today. ↑ "Barbara Mikulski ancestry". rootsweb.com. ↑ "Christine Mikulski, Mother of U.S. Senator, Dies". The Washington Post. April 1, 1996. p. B.04. 1 2 Weiss, Max. "The Baltimore Grill: Barbara Mikulski," Baltimore (magazine), August 2007. 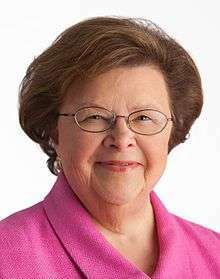 ↑ Senator Barbara Ann Mikulski (biography) – Poles in America Foundation, Inc.
↑ O’Rourke, Lawrence “GENO: The Life and Mission of Geno Baroni”, Paulist Press. (1991), p 87. 1 2 3 Barker, Karlyn (November 6, 1974). "Mathias Is Elected To a Second Term". The Washington Post. p. A12. ↑ Richards, Bill (February 3, 1974). "Sen. Mathias Re-Election Drive Opens". The Washington Post. p. B1. ↑ "U.S. Senate Choice in Maryland". The Washington Post. October 22, 1980. p. A22. ↑ Philip D. Duncan, Brian Nutting, ed. (1999). CQ's Politics in America 2000: the 106th Congress. CQ Press. p. 606. ISBN 1568024703. 1 2 Miller, John J. (July 8, 2004). "The Outing". National Review Online. ↑ Aitken, Lee (November 3, 1986). "Barbara Mikulski and Linda Chavez Stage a Gloves-Off Battle in a Women-Only U.S. Senate Race". People. Retrieved June 26, 2012. ↑ Kamber, Victor (2003). Poison Politics: Are Negative Campaigns Destroying Democracy?. Basic Books. p. 152. ISBN 0738208728. ↑ Sheckels, Theodore F. (2006). Maryland Politics and Political Communication, 1950–2005. Lexington Books. p. 84. ISBN 0739114158. ↑ Harari, Fiona (2011). A Tragedy in Two Acts: Marcus Einfeld and Teresa Brennan. Melbourne Univ. Publishing. p. 70. ISBN 052286046X. ↑ Dendy, Dallas L., Jr.; Anderson, Donnald K. (1987). "Statistics of the Congressional Election of November 4, 1986" (PDF). U.S. Government Printing Office. Retrieved August 3, 2012. ↑ Almanac of American Politics. National Journal. 2012. p. 739. ↑ "Barbara Mikulski, the record-breaking not-so-gentle-lady". The Washington Post. March 23, 2012. Retrieved November 21, 2014. ↑ Bash, Dana (March 16, 2012). "Mikulski makes history while creating 'zone of civility' for Senate women". CNN. ↑ "In 'The Clinton Tapes,' Bill Clinton Disses Bush, Dowd, Gore and More". Politics Daily. ↑ "S. 1086 - Summary". United States Congress. Retrieved 13 March 2014. 1 2 3 Cox, Ramsey (March 13, 2014). "Senate passes child care bill". The Hill. Retrieved 14 March 2014. ↑ "S. 2199 - All Actions". United States Congress. Retrieved 9 April 2014. 1 2 Cox, Ramsey; Bolton, Alexander (9 April 2014). "Senate GOP blocks paycheck bill". The Hill. Retrieved April 9, 2014. ↑ "U.S. Senate: Legislation & Records Home > Votes > Roll Call Vote". senate.gov. ↑ "Mikulski Joins FTC and HUD to Announce Major Settlement for Victims of Fairbanks Capital". Office of Senator Barbara Mikulski. November 12, 2003. Retrieved June 26, 2012. ↑ "Text - S.Res.221 - 113th Congress (2013-2014): A resolution designating the week of October 7 through October 13, 2013, as "Naturopathic Medicine Week" to recognize the value of naturopathic medicine in providing safe, effective, and affordable health care. - Congress.gov - Library of Congress". congress.gov. ↑ "The Best and Worst of Congress 2014". Washingtonian. Retrieved March 2, 2015. 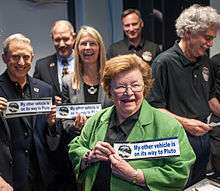 ↑ "Hubble Archive, Supernova Named in Honor of Mikulski". SpaceNews.com. ↑ "HubbleSite - NewsCenter - Space Astronomy Archive and Distant Supernova Are Named in Honor Of U.S. Senator Barbara A. Mikulski (04/05/2012) - Release Images". hubblesite.org. ↑ "Prezydent odznaczył Senator USA Barbarę Mikulski" (in Polish). prezydent.pl. August 22, 2013. Archived from the original on April 2, 2015. Retrieved 22 March 2015. ↑ "President Obama Names Recipients of the Presidential Medal of Freedom". The White House. November 16, 2015. Retrieved November 16, 2015. Wikimedia Commons has media related to Barbara Mikulski.